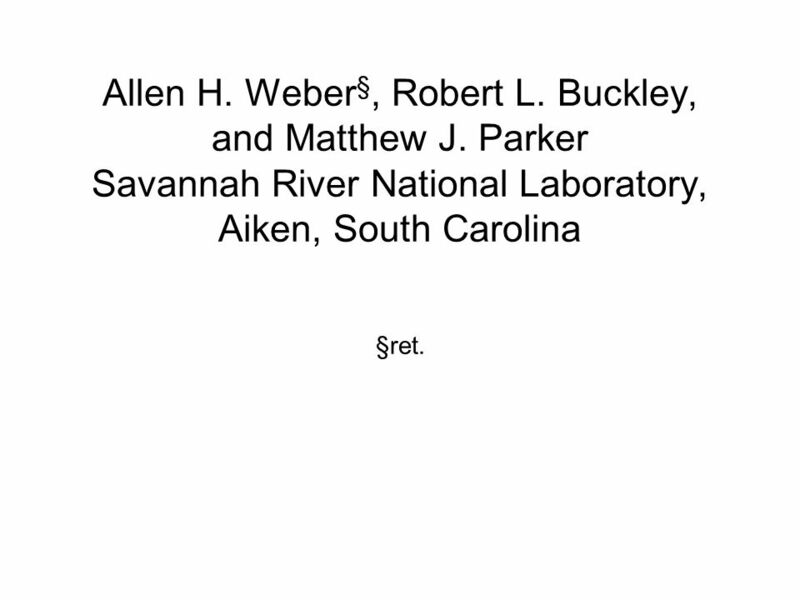 Allen H. Weber§, Robert L. Buckley, and Matthew J. Parker Savannah River National Laboratory, Aiken, South Carolina §ret. 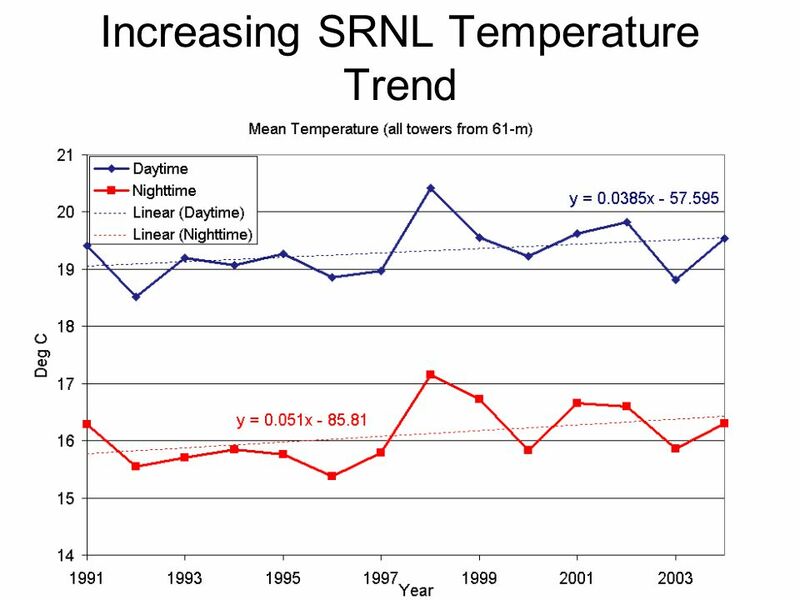 NWS and SRNL data show the mean annual daytime and nighttime temperatures are increasing ~0.04 and ~0.05 ºC respectively, per year. 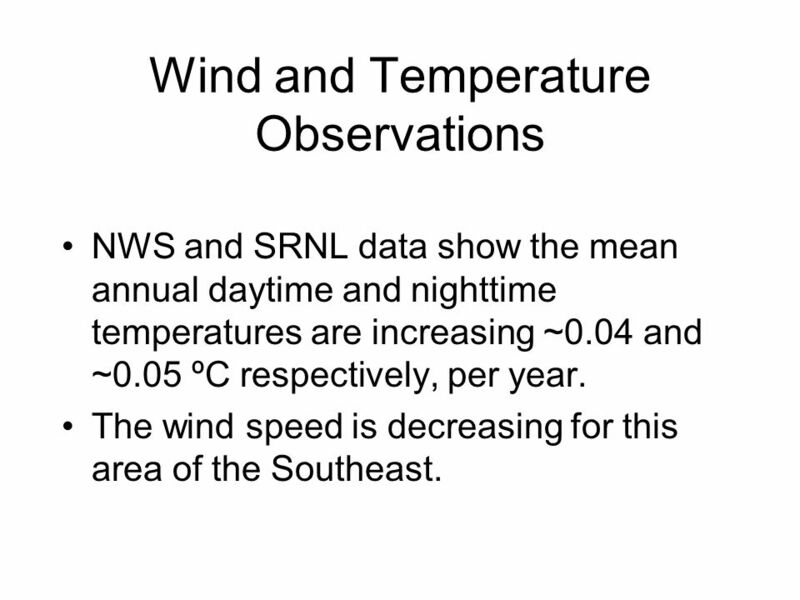 The wind speed is decreasing for this area of the Southeast. 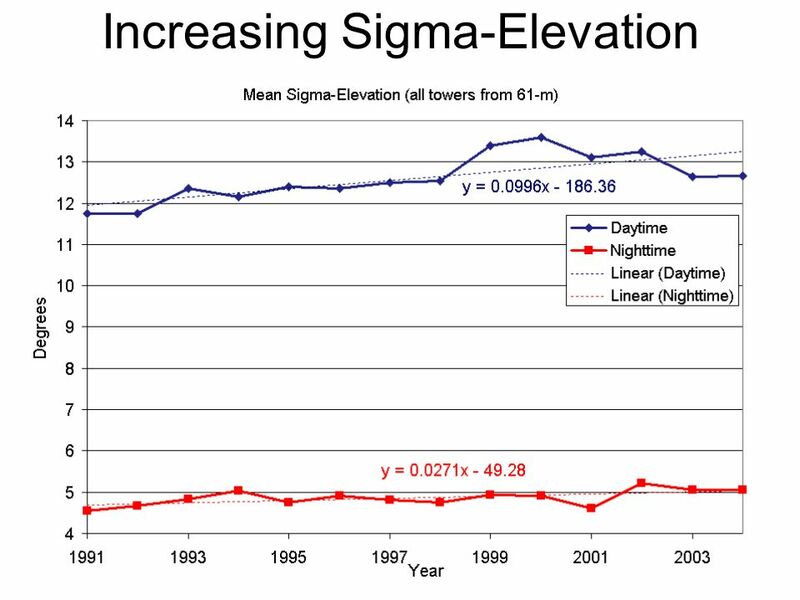 E for daytime and nighttime from SRNL Area Towers is increasing at a rate of ~0.03 and ~0.01 degrees per year, respectively. 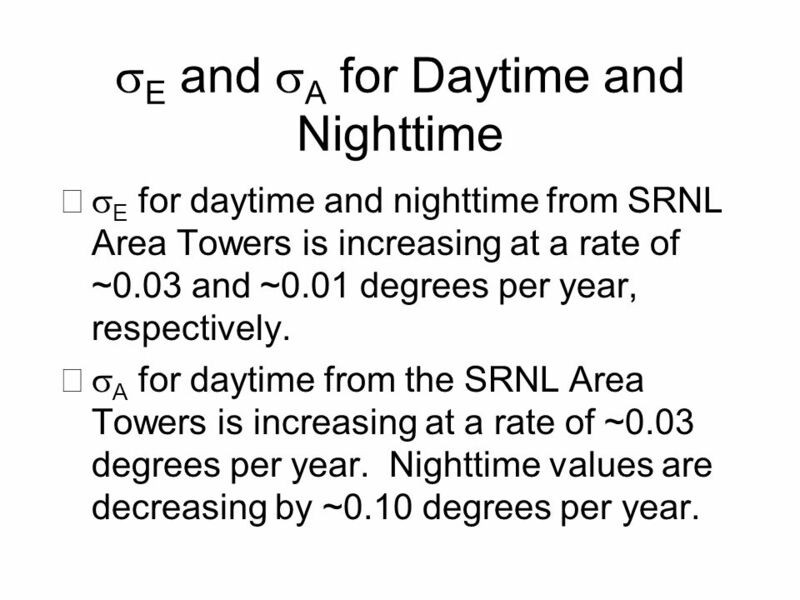 A for daytime from the SRNL Area Towers is increasing at a rate of ~0.03 degrees per year. 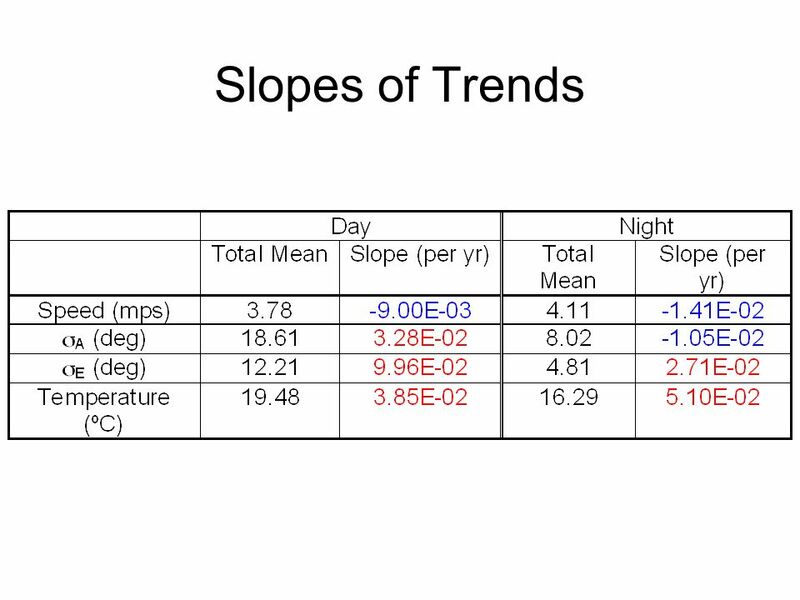 Nighttime values are decreasing by ~0.10 degrees per year. 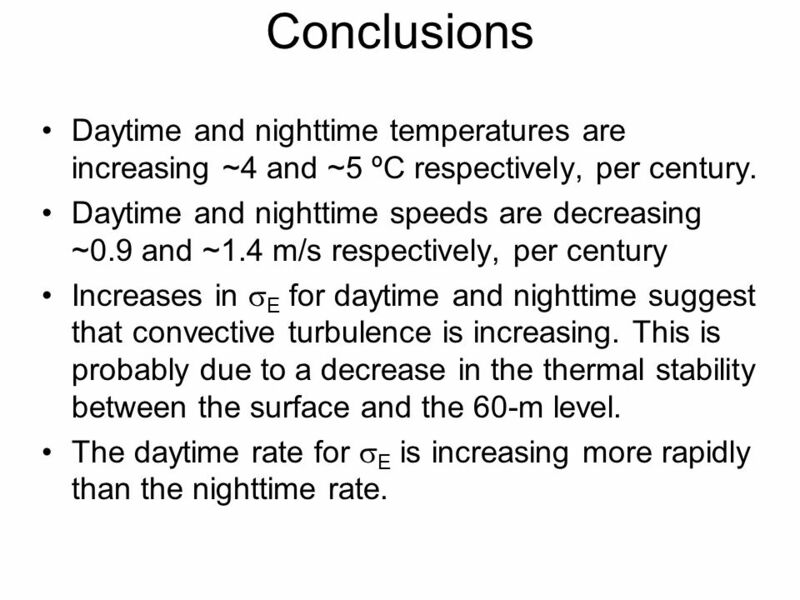 15 Conclusions Daytime and nighttime temperatures are increasing ~4 and ~5 ºC respectively, per century. 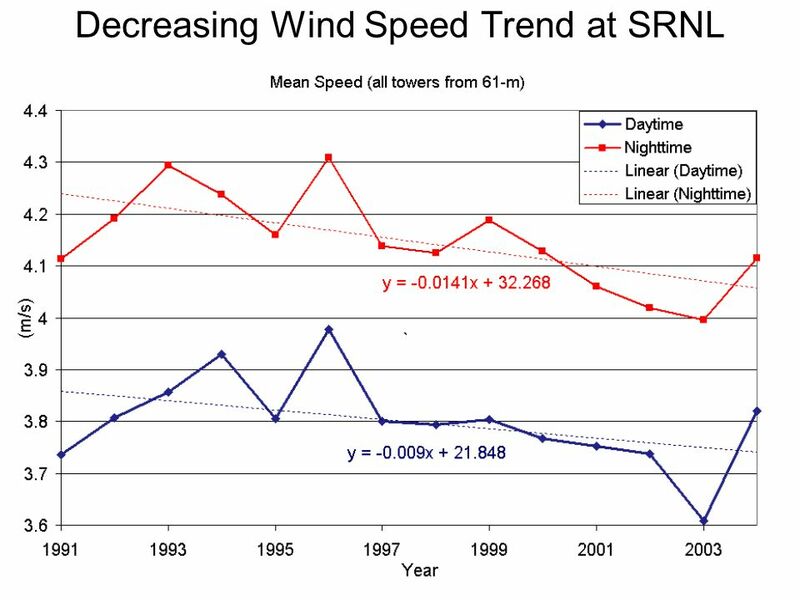 Daytime and nighttime speeds are decreasing ~0.9 and ~1.4 m/s respectively, per century Increases in E for daytime and nighttime suggest that convective turbulence is increasing. 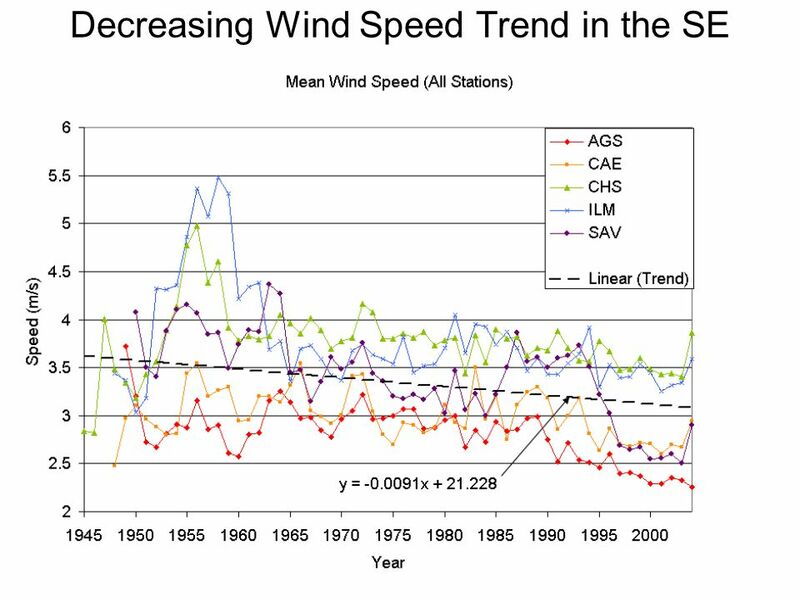 This is probably due to a decrease in the thermal stability between the surface and the 60-m level. 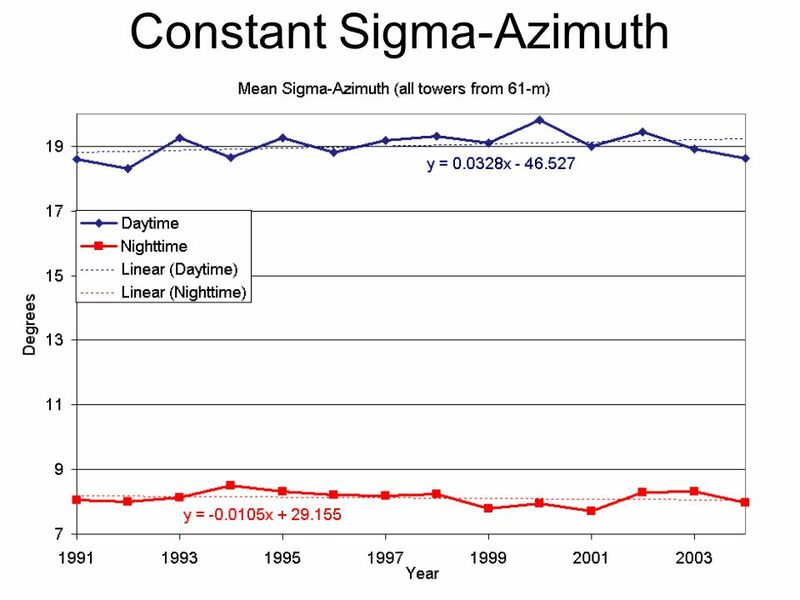 The daytime rate for E is increasing more rapidly than the nighttime rate. 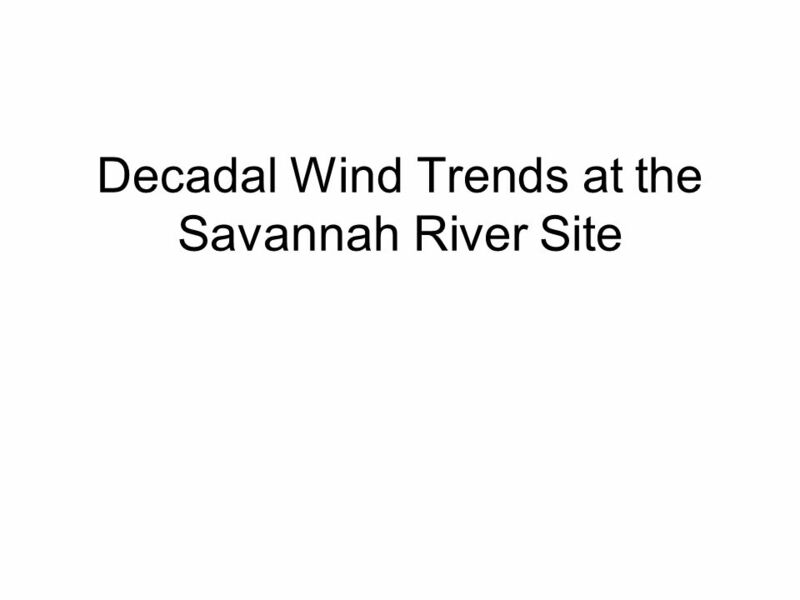 Download ppt "Decadal Wind Trends at the Savannah River Site"
The Reasons for the Seasons A pre-lab experience…. 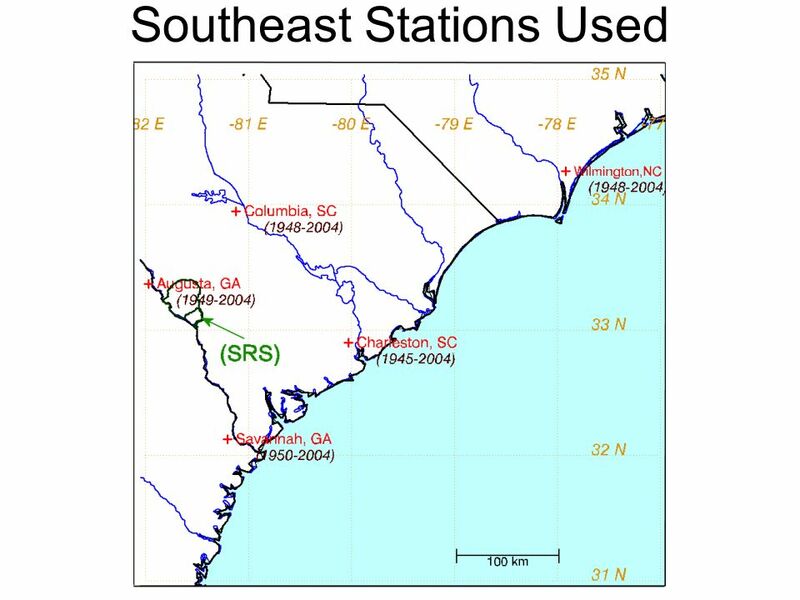 An Examination of Strong Wind Events Over the Last Half-Century at Five National Weather Service Stations near Coastal South Carolina by A. H. Weber, M.
21M062007D The Shaw Group Inc. ® An Analytical Screening Technique to Estimate the Effect of Cooling Ponds on Meteorological Measurements – A Case Study. Whats Up with the Weather? A Data Analysis Project Math and Science join hands. Spatiotemporal distribution of Taiwan cetacean stranding Stranding definition Stranded cetacean is defined narrowly as having run aground and in a helpless. Charles A. Ward Thermodynamics and Kinetics Laboratory, University of Toronto Fluid Behavior In Absence Of Gravity: Confined Fluids and Phase Change Second. 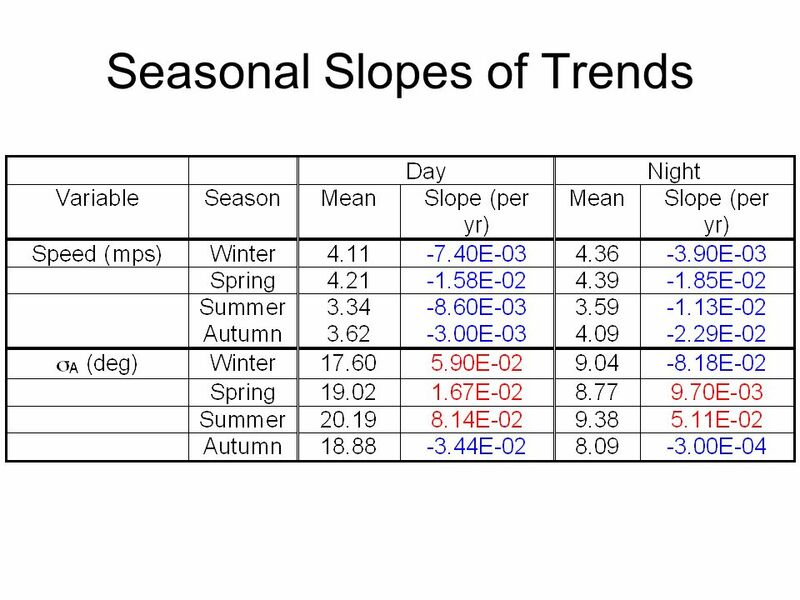 A synthetic report of recent climatic changes and their impacts on energy and water budgets over the Tibetan Plateau (TP) Kun Yang, Jun Qin, Wenjun Tang. 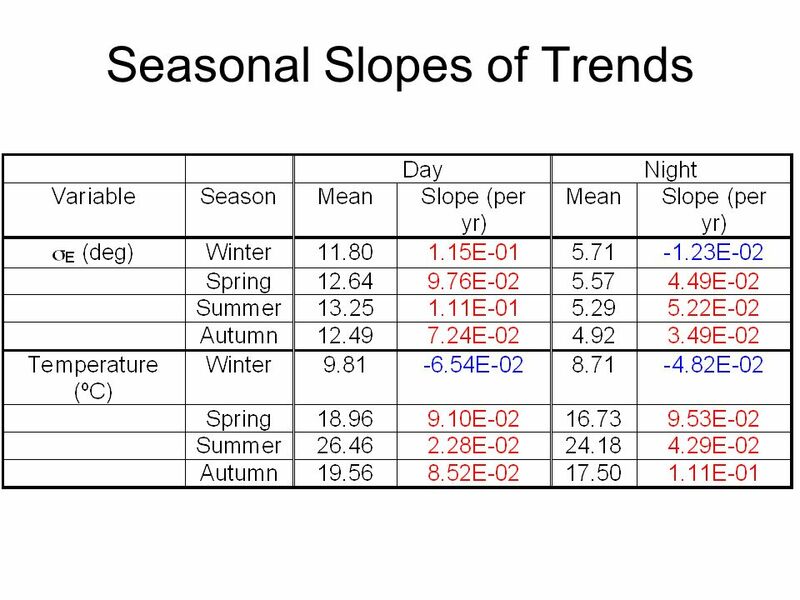 Climate Research in Nepal Himalayas Saraju K. Baidya (Department of Hydrology & Meteorology) “Mountains, witnesses of global changes. Research in the Himalaya. Sandy desert Modifications of the surface radiation budget. 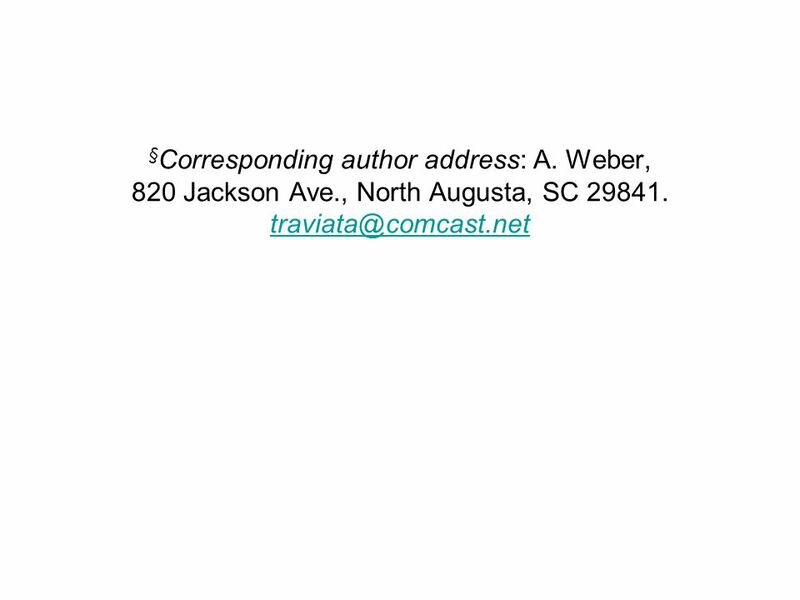 Weather and X/Q 1 Impact Of Weather Changes On TVA Nuclear Plant Chi/Q (  /Q) Kenneth G. Wastrack Doyle E. Pittman Jennifer M. Call Tennessee Valley Authority. Panel Discussion National Tribal Forum on Air Quality Radioactive Blowing Dust Environmental Programs Department Ute Mountain Ute Tribe Scott Clow, Tomoe.